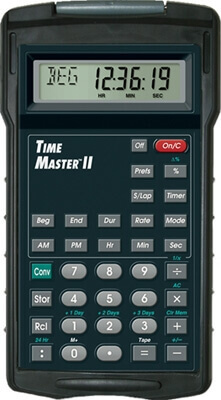 The Time Master II is a versatile, easy-to-use calculator for time-math measurements, conversions, schedules, rate-based estimates and solving elapsed time calculations using its built-in stopwatch/timer. Instantly determine time-based costs and rates for billing and estimates. It is an ideal tool for Cooks and Chefs monitoring cooking time, up or down. Students and public speakers time presentations. Coaches and Athletes use the Time Master II Stopwatch and Timer with Split/Lap feature to track elapsed times and performance. Time-math measurement and conversion in Hours, Minutes or Seconds; Hours:Minutes:Seconds (h:m:s), Auto-Entry; or Decimal format.